To welcome fall, we created a "Raking In Good Books" bulletin board. I gave each student a leaf cut-out and had them record a favorite book and the reason why. Then, when a student is looking for a recommendation, they can go and check out a leaf from our "leaf pile." It's a great way to get kids talking about the books their read and sharing their opinions about what they liked and didn't like about certain series, authors, genres, etc. 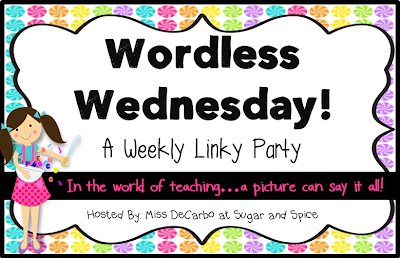 Hop on over to Sugar and Spice to check out other Wordless ideas!